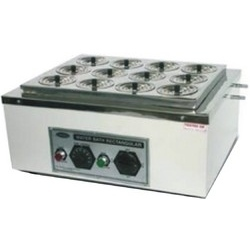 SGM Electrically operated, Water Bath is made of thick Stainless Steel and has constant level of water. Complete with concentric rings wire plug, etc. It is provided with drainage facility. Concentric rings have the 75 mm dia. Single Wall is manufactured using high quality material and well known for their high performance and strength. This bath machine consists of a thermostatic controller to control the temperature level. This water bath can be purchased from GSM at market leading prices. This equipment has a removable glass tray and a stainless steel platform for drying of sections. They are available in various types including single and double walled rectangular water baths which can also be used for sterilizing, drying of objects and laboratory glassware. SIZE INSIDE (Stainless Steel) WHOLE SIZE CAP. APPROX. 1. Water Bath Rectangular Single Walled is made of Heavy Gauge Stainless Steel with Concentric rings. 2. Water Bath Rectangular Single Walled fitted with Heating Element for uniform heating throughout. 3. To work on 220/230 Volts A.C. supply. 4. In medical institution and research laboratories. 6. Bio-Chemical industries and many other industries.